Great white egrets flying on Buffalo Bayou past banks of Memorial Park that would have been bulldozed. Photo by Jim Olive. Many people have never had an opportunity to experience the wild mystery of Buffalo Bayou. 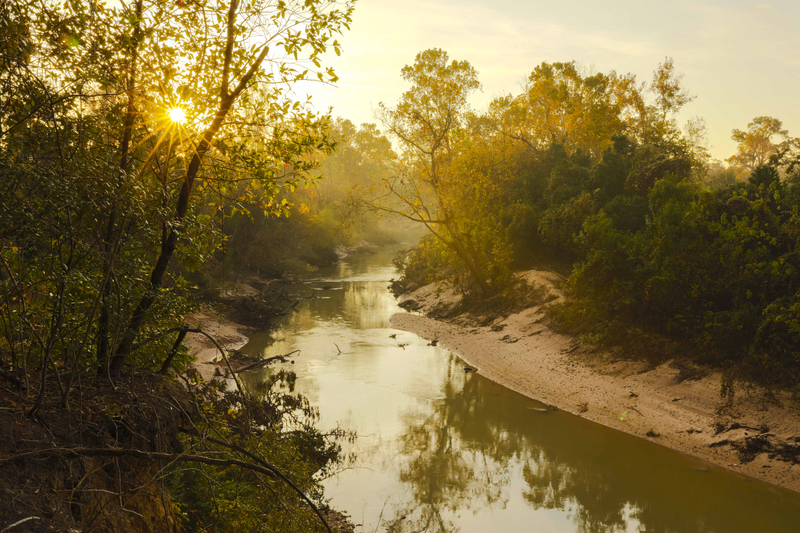 The stretch of the bayou flowing past our great Memorial Park in the middle of Houston is a historic nature area — filled with ancient high bluffs, sandstone, and sandy banks. Few other American cities have such a valuable public asset running through it. This public riparian forest is an outdoor classroom, a refuge of serenity and calm. It also serves vital ecological functions, including slowing and absorbing flood waters, cleansing the water and air, and providing wildlife habitat. Fly down Buffalo Bayou with photographer Jim Olive. These stunning photos were taken in October 2015, September 2016, and April 2017. Watch the changing of the seasons on a bend in the bayou. Jim Olive has been taking these photos from a high bluff in Memorial Park looking downstream for the last several years. Watch this slide show of beautiful photographs of the bayou in Memorial Park taken in July 2014 by Jim Olive. Here are some lovely aerial films taken of the prehistoric bluffs along the meanders in Memorial Park and the Hogg Bird Sanctuary. Our Buffalo Bayou is 18,000 years old, plus or minus a couple of thousand years, and it took that long to cut down through these much older Pleistocene land forms that serve as “bumpers” to the bayou, controlling its course and holding it in place. A summer sunrise on Buffalo Bayou in Memorial Park, July 1, 2018. Visit Save Buffalo Bayou’s YouTube page for more recent videos. Watch this hauntingly beautiful short video of the shady riparian forest, the vertiginous cliffs, and ancient sandstone banks of Buffalo Bayou. Yes, we have rocks in Houston. And cliffs! All this would have been bulldozed if the Harris County Flood Control District were to carry out its Memorial Park Demonstration Project. Very informative comment from Douglas Molineu sent by email to Save Buffalo Bayou. A Must Read! I have recently read of the Corps’ Memorial Park Demonstration Project that massively impacts the banks of Buffalo Bayou inside of Memorial Park. I strongly urge that this project not be undertaken. I have worked as an archaeologist with J.K. Wagner and Company, Inc. inside of Memorial Park, I have kayaked down the bayou inside the park, and I have used the walking paths and other facilities of Memorial Park as a private citizen along with my family. The planned modification of Buffalo Bayou through Memorial Park would destroy one of the last remaining areas of natural beauty, historical significance, and riparian habitat which exist inside of Houston. This is an area I have looked forward to sharing with my family, including my two young daughters, since I first experienced it soon after moving to Houston. From an archaeological standpoint this stretch of bayou hosts a myriad of sites, both recorded and not, dating to the prehistory of this region as well as to early settlement of Houston, Harris County, and Texas. Additionally, with J.K.W. and Co. I have helped to document the continued existence of groves of trees and other bayou features which are mentioned in the diaries and property records of the earliest explorers and settlers of Houston. Military sites dating from the Texas Revolution, through the Civil War, and both World Wars can also be found on and adjacent to this stretch of the bayou. This stretch of Buffalo Bayou offers an almost unique and mostly undisturbed window into some of the earliest periods of our city, county, and state as well as the use of the land by indigenous peoples in pre-colonial periods. While walking and kayaking through Memorial Park along Buffalo Bayou I have seen animal species that have both surprised and delighted me; including alligators, a large variety of species of water snakes and turtles, as well as numerous birds and small mammals. These are species which would be heavily impacted, if not eradicated, by this bayou modification. One of the great joys I have had with my girls has been walking along the banks of the bayou and seeing the diversity of species present. I have planned to look again for the alligators when they are old enough to kayak safely along the bayou. All this would be lost with this planned modification. The loss of archaeological and historical sites due to this bayou modification would, I believe, constitute an irreparable loss of knowledge and identity for the people of Houston as well as for Harris County and Texas. The loss of this almost unique urban riparian habitat would constitute an irreplaceable loss of one of the few surviving natural resources in Houston, Texas, and the United States. I cannot urge you strongly enough to not undertake this project.